The postponement of first childbirth has been occurring in most European countries for some decades now. In public and media discussion, delayed childbearing is often rather glibly associated with the fact that more women are going to university and getting jobs, and that they consequently want fewer children. Researchers find that for women born in 1965 and earlier, birth postponement, be it caused by education and career investments or by economic uncertainty, has led to higher childlessness and lower family size in Europe (Philipov and Kohler 2001; Kohler, Billari and Ortega 2002; Frejka and Sardon 2006; Sobotka 2003 and 2004). Signs of a trend reversal? However, our analysis suggests that the picture will be less clear for women who are currently at childbearing age. By taking into account younger cohorts and a larger set of European countries, and by differentiating between socio-economic determinants of birth postponement, we find evidence that under certain circumstances, birth postponement may facilitate rather than impede family formation. Our analysis is based on survey data from the European Union Statistics on Income and Living Conditions (EU-SILC), which can be used to examine the interaction between demographic and socio-economic variables for a large number of European countries. We apply a ‘synthetic cohort approach’ and compile data specifically to reduce endogeneity (education and labour market status are observed before the potential conception of a first child) and to eliminate truncation (semi-retrospective approach to avoid observing women who have not yet completed education) and other possible structural effects (see d’Albis, Greulich and Ponthière, 2017, for more details on the methodology). Figure 1 shows the extent of the “first childbirth” phenomenon by age for various educational levels (averages for 28 European countries), or, in simpler words, the percentage of women who have had at least one child, by age and education. This percentage increases with age. 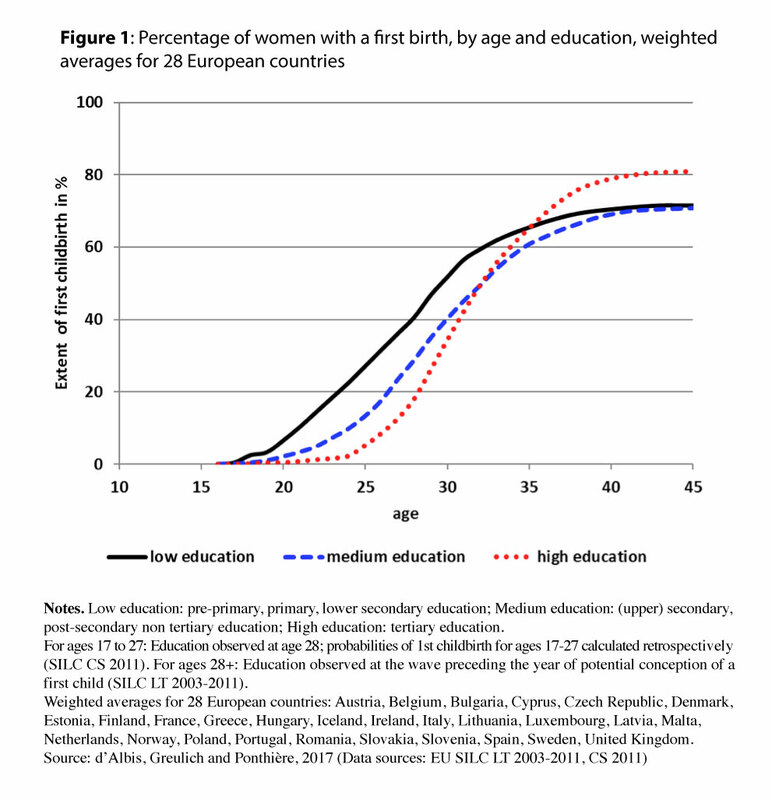 Figure 1 shows that by age 45, the oldest age considered, 71.6% of women with low education have had a first birth, 70.8% of those with medium education, and 81.0% of those with high education. Figure 1 also illustrates that higher education is associated with birth postponement. 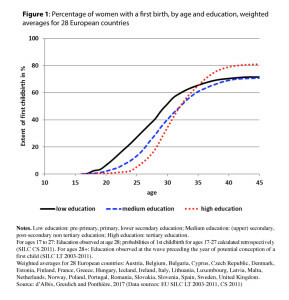 Low-educated women are more likely to have a child while they are young than women with medium and high education. The percentage with a “first childbirth” is higher up to age 32. By contrast, women with high education tend to have their first child later than other women, as seen in their lower percentage up to age 32. However, Figure 1 shows that they are more likely to become mothers at some point. It is tempting to interpret the findings of our synthetic cohort as showing highly educated women ‘catching up’ with the fertility of less educated women. However, the figure must not be seen in this way, because our calculations are based on a cross-sectional sample including thirty cohorts, rather than a single cohort monitored over time. The figure shows, nevertheless, a picture of the current fertility behaviour of those cohorts who are now at childbearing age. We find the same stylized fact in all subgroups of countries: in all regions of Europe, more educated women wait longer before having their first child than less educated women; but ultimately, highly educated women are more likely to become mothers by the end of their childbearing years. However, the regions differ in terms of the size of the gap between women of different education levels. In the Nordic countries, the gap between high- and low-educated women is substantial. In Central and Eastern Europe, the gap is negligible and the percentage of women with a first birth is relatively low in all education groups. Consequently, educational level is a much better predictor of childlessness at age 45 in the Nordic countries than in other European regions. The fact that highly educated women are most likely to become mothers in the Nordic countries might be linked to the fact that public institutions in this region are particularly supportive of maternal employment. Of course, other labour market-related issues such as job stability and income security may also play a part here. When analysing the timing and extent of first childbirth by age and activity status, we find that, for all ages, the extent is higher for women who work than for those who do not. The gap between working and non-working women remains wide until the end of the childbearing years. It seems that unsuccessful integration into the labour market not only postpones first childbirth, but sometimes also prevents it. Our analysis contributes to the discussion on the connection between birth postponement and fertility levels for younger cohorts in European countries. Our results suggest that public policies that encourage educational investment, promote secure employment and help parents to combine work and family life all have the potential to increase fertility despite birth postponement. Of course, our conclusion is only partial: to get a complete picture one would need to analyse and forecast the extent of all birth orders by education, activity status and institutional context. But the signs of a reversal of past trends are visible: postponement need not be associated with lower fertility among future cohorts in Europe. d’Albis H., Greulich A., Ponthière G. (2017): “education, labour, and the demographic consequences of births postponement in Europe.” Demographic Research, Vol. 36, Art. 23, pages 691-728. Frejka T., Sardon J.-P. (2006): “First birth trends in developed countries: Persisting parenthood postponement.” Demographic Research, Vol. 15, Art. 6, pages 147-180. Kohler H.-P., Billari F. C., Ortega J.A. (2002): “The emergence of lowest-low fertility in Europe during the 1990s.” Population and Development Review 28(4), 641–681. Philipov D., Kohler H.-P. (2001): “Tempo effects in the fertility decline in Eastern Europe: Evidence from Bulgaria, the Czech Republic, Hungary, Poland and Russia.” European Journal of Population 17(1): 37-60. Sobotka, T. (2003): “Tempo-quantum and period-cohort interplay in fertility changes in Europe. Evidence from the Czech Republic, Italy, the Netherlands and Sweden.” Demographic Research 8(6): 151-213. Sobotka, T. (2004): “Is lowest-low fertility in Europe explained by the postponement of childbearing?” Population and Development Review 30, p. 195‑220.